The "Lavish First Edition DigiPack" includes the full opera on two hybrid SACDs + a bonus "Making Of 'Ça Ira '" DVD and a 60-Page four-color booklet containing libretto, cast credits, & original Illustrations. "Ça Ira" is being released in the hybrid SACD (Super Audio CD) format in Dolby Digital 5.1 SurroundSound. The hybrid SACD disks are compatible with standard CD players. A classical opera in three acts by Roger Waters after original libretto by Nadine and Etienne Roda-Gil. Waters was writing songs and orchestra-music for this story, that was intended to be part of the French revolution bi-centenary in 1989. The original English working title for the opera was: "We'll make it", but the project was not finished in time. Waters probably stopped the work when he started planning the Berlin concert (1990). In 1998 he continued the work on the project together with composer Rick Wentworth and the result is scheduled to be released "early this millenium". Roger Waters recent tours and recordings for a new concept album has probably pushed the opera a little further away once again. There will be a semi-staged concert performance of "Ça Ira" live in Rome at the 2,000 seat Parco della Musica with the Roma Sinfonietta and the Cora Lirico Sinfonico Romano choir on November 17th and 18th, 2005. All the lyrics for 'Ca Ira' can now be found on the pink Floyd Hyperbase. Thanks to Zechariah for typing and submitting the lyrics to this site. -A film by Adrian Maben. 3 tracks from the new opera by Roger Waters premiered at EU accession event in Malta. After having worked on the opera project "Ca Ira" for several years Roger Waters finally gave a glimpse of what it's all about. On 1st of May Malta (and other countries) enter as new members of the European Union. A 15-minute part of "Ca Ira" was played as part of the celebrations at the Grand Harbour in Malta at midnight. The music was not a live performance but part of a visual show arranged by the German artist Gert Hof. "Ça Ira" is about the French revolution and the 3 tracks played were titled: "Ca Ira Overture", "Taking of Bastille" and "Sugar Indigo". SONY BMG MASTERWORKS/COLUMBIA RECORDS READIES THE RELEASE OF ROGER WATERS' LONG-AWAITED CLASSICAL OPERA, "ÇA IRA"
Sony BMG Masterworks/Columbia Records is proud to announce the release of "Ça Ira," Roger Waters long-awaited "operatic history of the French Revolution," on Tuesday, September 27. The lavish first edition of "Ça Ira," an opera in three acts for full orchestra, soloists and choirs, will include a double SACD DigiPack and a deluxe 60 page four-color booklet including Roger Waters' lyrics based on Etienne Roda-Gil's original French libretto, the original illustrations created by Nadine Roda-Gil, biographies of Waters and the opera's cast, background and production notes on the opera. 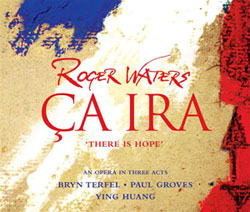 As a bonus for Roger Waters fans, "Ça Ira" includes a special DVD documentary chronicling the "making of" the opera. The "Ça Ira" DVD traces the history of the project, from conception to completion, and includes revelatory interviews with Waters and the musicians and cast of "Ça Ira" as well as exclusive in-the-studio footage of the recording of the opera. "Ça Ira" is being released in the hybrid SACD (Super Audio CD) format in Dolby Digital 5.1 SurroundSound. The hybrid SACD disks are compatible with standard CD players. Waters, who co-founded the groundbreaking rock group Pink Floyd in 1966, began to bridge the worlds of rock and classical music in such pioneering major works as "The Dark Side Of The Moon" (1973) and "The Wall" (1979) in which he incorporated elements of operatic form--theatricality, coherent narrative, dramatic arcs, thematic music and song cycles--in a pop context. Waters' work on "Ça Ira," his first opera for full orchestra and voice, began in 1989, during the Bicentennial of the French Revolution. The well-respected and successful songwriter Etienne Roda-Gil and his wife, Nadine, had created an original libretto for an opera, written in French, as part of the Bicentennial. Entitled "Ça Ira," after a revolutionary song of the period, the Roda-Gil's original manuscript, copiously and beautifully illustrated by Nadine, portrayed the events and the spirit of the French Revolution through a multitude of perspectives--ranging from Marie Antoinette to the eyes and ears of the period's revolutionaries and common people--using a circus as a central theatrical framing device and metaphor. Introduced to Etienne Roda-Gil by a mutual friend, Waters was immediately and deeply impressed by the passion and the power of Etienne's manuscript and began work on creating a full orchestral score for "Ça Ira." Work on the project was suspended when Nadine died tragically of leukemia. Several years passed before Roger and Etienne returned to "Ça Ira." In 1997, Roger began writing an English version of the text. "It's not just a translation," he says. "I've stuck very much to the spirit of Etienne's original, adding to it somewhat. Although it's rooted in the history of the revolution, its philosophical slant is, I suppose, contemporary as well. It's more than just a history of the French Revolution, it's a piece about the human potential for change." The finished version of "Ça Ira" features orchestration and choral arrangements by Rick Wentworth and Roger Waters, also the album's producers. Principal characters in the opera are brought to life by the Welsh bass-baritone Bryn Terfel (the Ringmaster, the Troublemaker, Louis Capet - the King of France); internationally acclaimed soprano Ying Huang (Marie Marianne - the Voice of Liberty, Reason and the Republic, Marie Antoinette - the Queen of France); American tenor Paul Groves (A Revolutionary Priest, A Military Officer); and Nigerian "one man orchestra" Ismael Lo (a Revolutionary Slave). Other parts are sung by Jamie Bower (Honest Bird - the young Revolutionary Priest) and Helen Russill (Madame Antoine - the young Marie Antoinette). Before the rise and fall of the guillotine, before the terror took hold, the People of France fought for a better world based on the ideals of liberty, equality and fraternity rather than one ruled by a callous and outmoded nobility. It is this story of hope and promise that inspired "Ça Ira." Set during the optimistic early days of the French Revolution, "Ça Ira is a work of stunning power and beauty, invoking the passion, madness, and triumph of faith in a time that forever changed the nature of the world.